Six Iraqi national guards have been killed in a car bomb blast near the city of Baquba in the third such attack in hours against Iraqis and US troops. Four other guardsmen were injured in the blast at a checkpoint outside the city, the US military said. 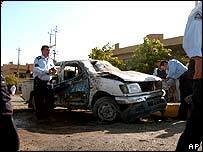 Earlier, a senior Iraqi police officer and two US soldiers were killed in roadside bomb attacks in Baghdad. Insurgents have increased their attacks on Iraqi security forces, who they see as collaborators with the US forces. Baquba lies 60km (35 miles) from Baghdad and has been a hotbed of resistance to US forces and the Iraqi security corps trained by them. In one of the worst attacks in recent weeks, nearly 70 people were killed on 28 July in a suicide bombing outside a police base there. The latest blast occurred about 1430 local time (1030GMT) just north of the city. The Associated Press news agency quoted an emergency worker at Baquba hospital as saying six injured guardsmen had been brought for treatment. But the US military said three had been killed. "The continued targeting of Iraqi security force personnel ... undermines the security of all Iraqis and will only quicken the resolve of Iraqi security forces to provide a safe and secure environment," said Maj Neal O'Brien, a US Army spokesman. Earlier in Baghdad, Colonel Moayad Mahmoud Bashar, chief of the Mamoun police station, was killed. He was travelling to work with two of his sergeants when their car was hit by a bomb at 0740 (0340GMT), police said. "After I heard a loud explosion, I rushed outside and saw the damaged police car with three bloodied people inside," AFP news agency quoted a resident of the area as saying. The US servicemen were on patrol in western Baghdad when their vehicle was hit by an improvised explosive device at 2300 (1900GMT) on Monday night. Two of their colleagues were wounded. Iraq has seen a spate of fresh violence since the US-led coalition handed over power to an interim Iraqi government in late June. A car bomb attack on Sunday against an Iraqi police station in the northern city of Mosul killed at least five people and wounded about 50 others.